Start your NFPA® Advance Membership now for the tools and training you need to keep your knowledge up-to-date and your career moving forward. You're working hard to help make the world a safer place -- and NFPA can help. NFPA Advance Membership is a powerful tool that helps boost your career trajectory with access to the vast global network of NFPA resources and expertise, plus best-in-class tools and training through huge learning discounts: free access to all online courses and 20% off all classroom training. A vital resource for moving up in the fire protection and fire safety professions, Advance Membership puts the training tools you need to get ahead at your fingertips. Your NFPA Advance Membership includes free access to every NFPA online training course. * New courses are continuously added. Free one-on-one help with technical standards questions from NFPA fire, building, electrical, and life safety specialists. Save 10% on all NFPA products and services, including all NFPA codes, classroom trainings, handbooks, online training courses, the National Fire Codes® Subscription Service, and other educational materials to increase your knowledge and skills. As an NFPA member, you can also join one of 11 NFPA Sections, where you can connect with experts worldwide in your field. Sections are excellent forums for exchanging ideas, solving problems, and building a network of peers. Get the most up-to-date news and information, trends, and research across a wide range of industries. Delivered six times a year, our award-winning NFPA Journal is the most trusted source for codes and standards information. Play a key role in establishing the future direction of fire prevention codes and standards. Voting privileges begin after 180 days of membership. *For a full course listing, please visit nfpa.org/OnlineCourses. Check out a course today -- try the FREE Online Learning demo! Visit nfpa.org/FreeDemo. 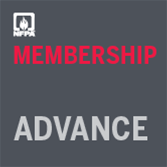 Note: NFPA Advance Membership does not include live online webinars. NFPA Advance Membership includes regular NFPA membership in addition to NFPA online training courses. Advance Membership is only available to individual members. This type of NFPA® Membership focuses on providing access to experts and information. This is for those who are seeking membership but do not require additional access to training and codes. This type of NFPA Membership includes all the benefits of a classic Engage Membership, but also provides access to education. All NFPA online training courses (60+ courses) are included, and there is a 20% discount on classroom training (10% more than with the Engage membership). This type of NFPA Membership includes all the benefits of Advance membership plus full access to the online version of NFCSS (National Fire Codes® Subscription Service). NFCSS provides unlimited access to all NFPA codes and standards documents, current editions and up to 5 prior cycles, and allows PDF downloads for offline use. NFPA® members are invited to maximize their membership benefits by joining one of our industry-specific Member Sections. Section membership is FREE and included with your NFPA membership. Click here to learn more.